…These biographies are also invested in a particularly modern kind of subjectivity, that of the heroic individual who bends history to his will. He’s a man of singular genius, one whose fortunes aren’t made by his family, commuity, or the times in which he lived. …Traditional biographies like these commemorate only some kinds of power and politics, and avoid the rest.… Stories about the sagacity, virtue, and political genius of our so-called “Founding Fathers” sell like hotcakes. History of science often defaults to stories about the heroic individual who bends nature to his will, the man of singular genius, whose achievements weren’t made possible by his family, his community, or the times in which he lived, but often despite that family, that community, or those times. Such stories commemorate certain kinds of power and knowledge while ignoring or explaining away others. Two recent but very different examples—one popular one scholarly—illustrate these points. “These 5 Men Were Scientific Geniuses. They Also Thought Magic Was Real” marvels at the genius of Galileo (and Kepler) despite their lingering belief in astrology, at Newton’s (and Boyle’s) despite their dabbling in alchemy, at Paracelsus’s despite his reliance on natural magic. These “geniuses” contributed to modern science despite their community and the times in which they lived. Internet audiences cannot get enough of these posts—this one has been shared nearly 10,000 times in four days. 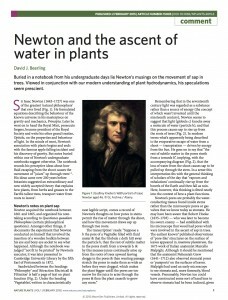 It should come as little surprise that Newton’s genius was capable of presciently imagining the germ of an idea explaining the ascent of sap in plants some two centuries before botanists came up with it for themselves. The latest effort to see Isaac Newton as founding father of all modern science. Its conflagration testified 2 Peter 3d, vers 6, 7, 10, 11, 12. The wiked (probably) to be punished thereby 2 Pet: 3 chap: vers 7. The succession of worlds, probable from Pet 3c. 13v. in which text an emphasis upon the word wee is not countenanced by the Originall. Rev 21c. 1v. Isa: 65c, 17v. 66c, 22v. Days & nights after the judgment Rev 20c, 10 v.
Reclusive and secretive, it’s doubtful he [Newton] gained botanical inspiration from conversations with others at Cambridge University interested in plants. Although his contemporaries were certainly thinking about plant anatomy and function around the same time. What would it look like to tell non-heroic histories of science? Can we make such histories compelling so that people would listen?